Bishop Edward Burns addresses the media during a press conference at St. Cecilia's on Sunday, Aug. 19, 2018 concerning the Rev. Edmundo Paredes who was pastor of St. Cecilia Catholic Church until 2017. Dallas Bishop Edward Burns and the Rev. Martin Moreno, pastor at St. Cecilia Catholic Church, discussed talking to parishioners about the church's former pastor, Edmundo Paredes, who was accused of molesting three teenage boys more than a decade ago. Rev. Edmundo Paredes prepares for communion during a mass in June, 2008 at St. Cecilia Catholic church, after fire destroyed the sanctuary. Updated at 4:50 p.m. with additional details throughout. The news regarding Paredes, who was pastor of St. Cecilia for 27 years, is only the latest revelation in the Catholic Church's ongoing priest pedophilia scandal. Independent investigations have revealed that members of the church hierarchy both turned a blind eye and actively engaged in covering up the actions of pedophiles in the priesthood. 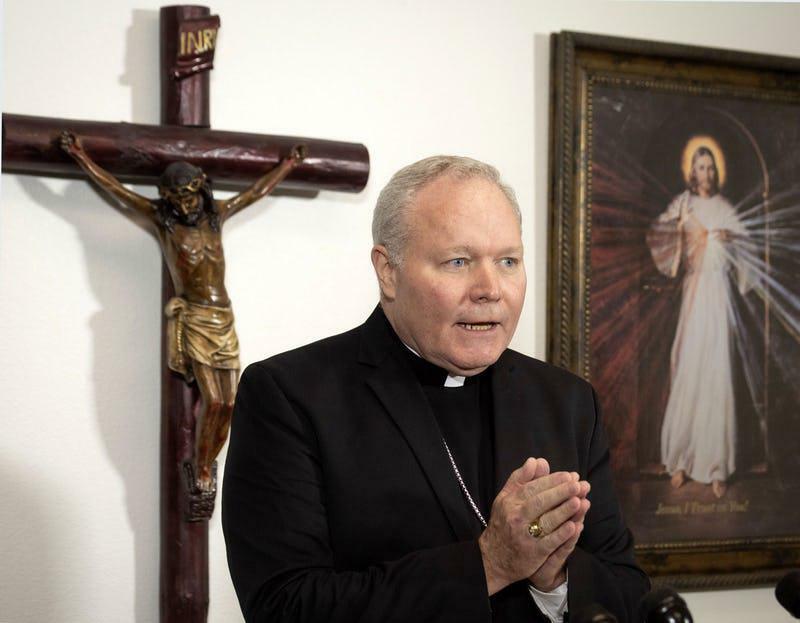 Burns detailed the allegations against Paredes from the altar Sunday morning and planned to remain at St. Cecilia throughout the day to speak at Masses and talk to parishioners, he said. "I need to come face to face with the frustration. I need to come face to face with this issue, with the anger, with the rage. I recognize this diocese cannot cover its ears, its eyes, its mouth. We need to look at this head on," Burns said in an interview after Mass. Parishioners lined up to speak to Burns after the morning Mass. Paredes, a graduate of Holy Trinity Seminary in Irving, is accused of molesting the boys during his service at St. Cecilia. In May 2017, Paredes came under investigation by the church for stealing from his parish. Church officials estimate he stole $60,000 to $80,000 in cash. He admitted to the financial misconduct and was suspended from the ministry and removed from St. Cecilia in June 2017, Burns said. The parish of about 3,600 parishioners serves a largely Latino population and does not have the financial resources of larger parishes in northern Dallas. After his suspension for financial irregularities, Paredes disappeared and may have left for the Philippines, though church officials do not know with certainty he is there. In February, during the course of the financial investigation, church officials received allegations of criminal sexual acts by Paredes, specifically that he had molested three boys in their midteens more than a decade but less than 20 years ago. Burns said church officials immediately contacted Dallas police, who began an investigation. The sexual allegations were found to be credible, Burns said. To protect the victims' identities, church officials did not specify the exact period of time when Paredes allegedly molested them, a spokeswoman said. 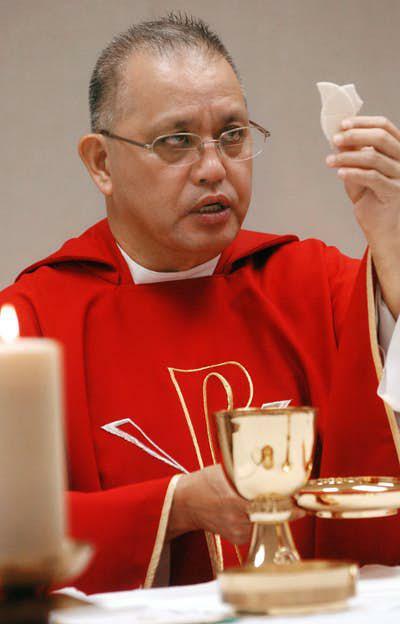 Paredes is no longer permitted to function or present himself as a priest, the bishop said. 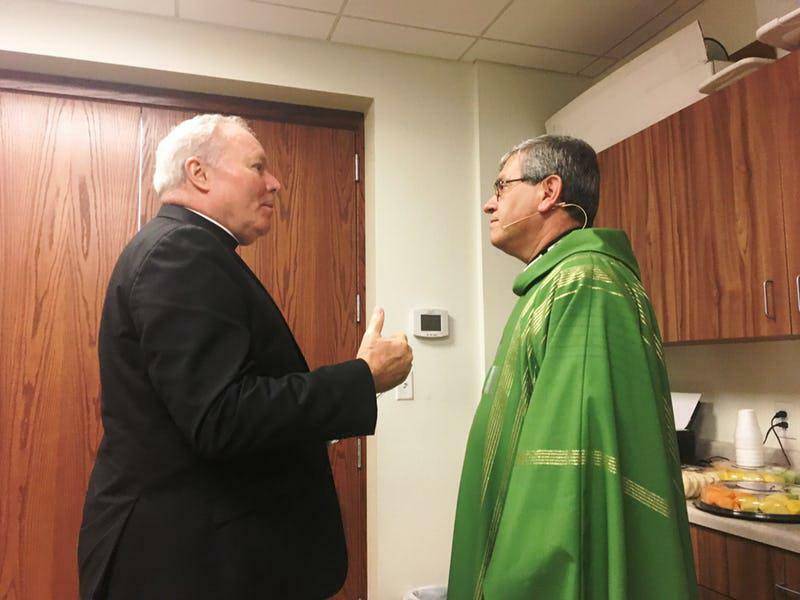 Burns decided to disclose the allegations to parishioners Sunday after a meeting Thursday with the Diocesan Review Board, a group of non-clergy Catholics who counsel the diocese on matters involving the sexual abuse of minors. He said Sunday that he wanted to make the allegations public after last week's report from Pennsylvania that said more than 1,000 children had been abused by clergy since the 1940s. Lisa Kendzior and Paul Petersen, local chapter leaders of the Survivors Network of Those Abused by Priests, said in a joint statement that they found it disturbing Burns didn't tell parishioners about the allegations sooner. "Why would Bishop Burns suppress this crucial information? Was it to protect the diocese from scandal?" the written statement said. "What about concern for the safety of children and the need to comfort any survivors? Where is the transparency that the Catholic bishops promised?" Petersen said he had been abused by Richard Johnson, a priest who was suspended in 2006 when he was at St. Patrick Church in Lake Highlands. Before St. Patrick, Johnson served at St. Cecilia. The diocese later settled cases with three men Johnson abused in the 1970s and '80s. Petersen said he was skeptical of the timing of the weekend announcement. "The fair question that every Catholic — and all the citizens of Dallas should ask — is what's special about today, that the revelation was made?" he said. The information was not disclosed earlier because Burns "did not want to hinder [the police] investigation or compromise the anonymity of victims," a church spokeswoman said. The Catholic Church is hiring private investigators to find Paredes, Burns told parishioners. 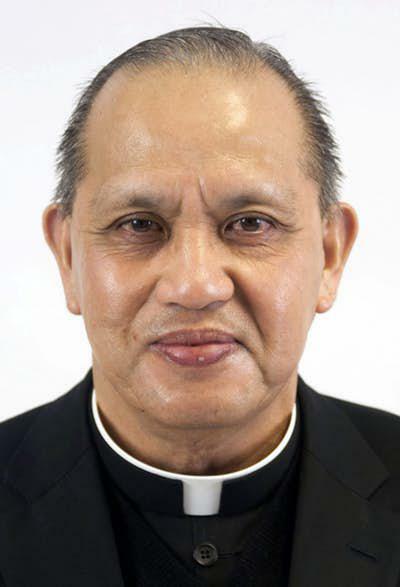 The church has contacted authorities in the Philippines and have heard back that they do not know where Paredes is. The Rev. Martin Moreno, the current pastor at St. Cecilia, asked for prayers for the parish. "I love you. I love you very much, and I will do anything to protect you like a parent does his children. I am willing to do anything I can with my own life to protect you," Moreno told parishioners. "The actions of one person do not represent the entire clergy of Dallas." At the 11 a.m. Mass, Chancellor Mary Edlund read a letter from the bishop detailing the accusations against Paredes, who was at a celebratory Mass for the installation of a new pastor at another church. The Rev. Daniel Rendon, vicar for the parish, encouraged church members with questions or concerns to speak up. "This is not who the church is," he said. "Little by little we'll go through this, and we will see the time when the healing will take its effect in us." After the service, 61-year-old Sylvia Segura broke down in tears as she said the news had caught her by surprise. When Edlund began reading the bishop's letter, Segura said she expected a statement of solidarity after the Pennsylvania Supreme Court released a 1,356-page document detailing a decades-long history of sexual abuse within the church in that state. "Just to find out that it was in our very own house that it had happened," she said. "It was very, very hard." Segura, who said she has been attending St. Cecilia's for almost 30 years, first met Paredes at Blessed Sacrament, his previous church in Oak Cliff. Segura attended there when Paredes was just starting his career, she said. She said she didn't care much about Paredes' admission that he stole church funds — "money doesn't mean anything to me," she said. But the allegations of abuse? "That is way off the charts. Way, way off the charts," she said. Until Sunday, Segura said she thought Paredes was living on church grounds. She recalled that he'd just celebrated his retirement last year. In June 2017, St. Cecilia's Catholic School had a retirement celebration honoring "Father Ed" for his 27 years of service, according to a Facebook page for the event. Paredes led the effort to rebuild St. Cecilia after a fire destroyed the church in August 2007. In 2011, an $8 million church was opened, with Paredes leading the ceremony. In Burns' letter, he noted that a church investigation found Paredes never touched money donated to rebuild the church. "While it has been a tremendous hardship in many ways for our parish, it is also a blessing in that this larger, new church will much better serve our very large, growing community," Paredes said at the time. Now, his name is added to a legion of Catholic priests who have been accused of sexually abusing children. Burns, who served with two of the 300 priests named in the document released by the Pennsylvania Supreme Court, called the revelations sickening. Although he served early in his career with the two named priests and knew a number of others, Burns said he was unaware of their actions or allegations against them. "Knowing that this occurred at the hands of men that you knew and even worked side by side with adds to a dimension of disbelief," he said.